There is a new real estate market emerging, both locally and nationally. With the influx of homes on the market, many in production builder subdivisions, it is hard to distinguish the value one home represents over another; so many homes are passed by. Drive through any of the newer subdivisions in Anytown, Indiana and you will find few differences between the homes on a given street, beyond landscaping. Every third or fourth house is essentially the same, depending on the amount of models the developer built in that subdivision. If you're selling your home, standing above the competition is imperative. When buyers begin looking for a home, they will generally narrow their search before they begin to actually visit homes. They have decided whether 3 or 4 bedrooms fit their needs, which area serves their commute time, what local amenities satisfy their lifestyle demands and the school district their children will attend. When presenting your home to buyer's, there needs to be a compelling reason for a buyer to choose your home over the other homes which are in the same price range with the amenities the buyer is looking for in a home. 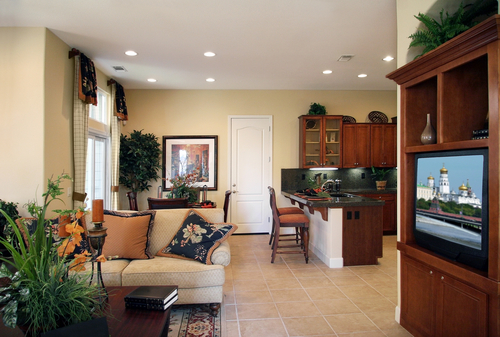 This is where "staging" can make a difference in the presentation of your home. Proper presentation takes place before your home goes on the market. It involves the obvious, such as cleaning, painting, trimming the landscaping and freshening up the interior. And there's the not so obvious; the placement of furniture or removing furniture to open up space; packing items which are not being used and depersonalizing your home. The pictures on the wall, items on the countertops; even the way your home smells. These are the very things which elicit an emotional response from the buyer. When buyers walk through the door of a home, we aim to create a "wow" response and we have about 60 seconds to do so. If their initial response is positive, they will go from room to room, assessing whether your space will fit their lifestyle, furniture and dreams. Staging Professionals are trained in the various aspects of creating an inviting atmosphere where home buyers can visualize your home as theirs. Their expertise has been proven to assist in the home selling process. The cost is minimal, especially when compared to the cost of not selling your home. When you're ready to sell your home, consider a staging consultant to maximize your homes appeal to the largest number of buyers in the market. Paula Henry is an Indianapolis Realtor with the Home to Indy Team, serving the needs of homeowners in the Metropolitan Indianapolis area. When you're ready to sell your home, you want an agent with a plan for helping you attain your dreams and goals. Contact Paula for your Indianapolis real estate needs.